The Sludgelord: ALBUM REVIEW: Revocation - "Great Is Our Sin"
This is a strong effort and the quality herein will only fully be revealed after multiple listens, I suspect. Revocation are now on album number six and show no signs of weakening or slowing in any way. ‘Great Is Our Sin’ is a masterclass. 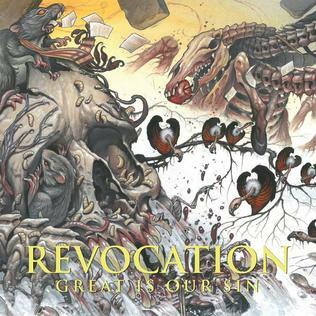 Revocation return after 2014's very well received “Deathless” with this full length effort. Technical, certainly... but are they death or thrash? Well, neither, being as they combine the two effortlessly for excellent results. No messing about, the title track is first up which mixes At The Gates with more American guitar approaches and no small amount of Bay Area thrash. “Theatre of Horror” keeps the bass drums pounding and the emphasis firmly on the technical, with lots of changes and unusual time feels. Revocation is not an unchallenging listen, and this one is no exception. However, their albums are enjoyable to listen to; unlike many tech death outfits, where after listening you feel as if you have run a marathon. The production is stellar of course, with triggers and slickness being part of this impressive sound. “Monolithic Ignorance” has a title which sounds like a Death track and the intro does as well! Things get a bit more thrash orientated from there, but blast beats are never too far away, to bring back the dm feel. New drummer Ash Pearson delivers the goods in a big way here, with lots of cymbal flourishes and pulverising double bass announcing his presence in the line up in a big way and the sound that Revocation conjure up is quite astounding. “Crumbling Imperium” brings the bass to the fore for the verses as the band keep the BPM count down while still impressing technically. “Communion” is a faster beast, but no less technically adept for it- excellent breakdown section is contained herein. With eleven tracks, this takes us almost to the halfway point, which is passed in “The Exaltation” which utilises some unusual rhythmical approaches and changes- no vocals, but it holds your attention throughout. The album has a nice even flow to it, despite the myriad of changes and the tracks are always engaging. “Profanum Vulgus” sees the return of vocals and again echoes Death with the approach in the verses, I thought. Excellent soloing abounds in the breaks which fluidly shifts over the time changes. “Copernican Heresy” blasts away and provides the record with a more straightforward track (still with a faire few changes, mind). The superbly titled “Only The Spineless Survive” is a rather bleak listen, but the first guitar break really highlights the sheer thickness of the guitars before more jazz inflected passages arise in the breaks. “Cleaving Giants of Ice” has a spookily clean intro, and the track that follows is rather epic in sound, if not in scale- a little over four minutes. This is the last track of the album, per se, as the final track is a cover of Slayer's vicious “Altar of Sacrifice”- which absolutely rules and also serves to point out that Revocation are not a thrash band in the purest sense. This is a strong effort and the quality herein will only fully be revealed after multiple listens, I suspect. Revocation are now on album number six and show no signs of weakening or slowing in any way. A masterclass.